I woke up on Thursday morning at about 5.15am – just fifteen minutes before my alarm went off. Way too early to be getting up! I lay struggling to wake up for about twenty minutes before jumping out of bed, grabbing a shower, and heading out the door. 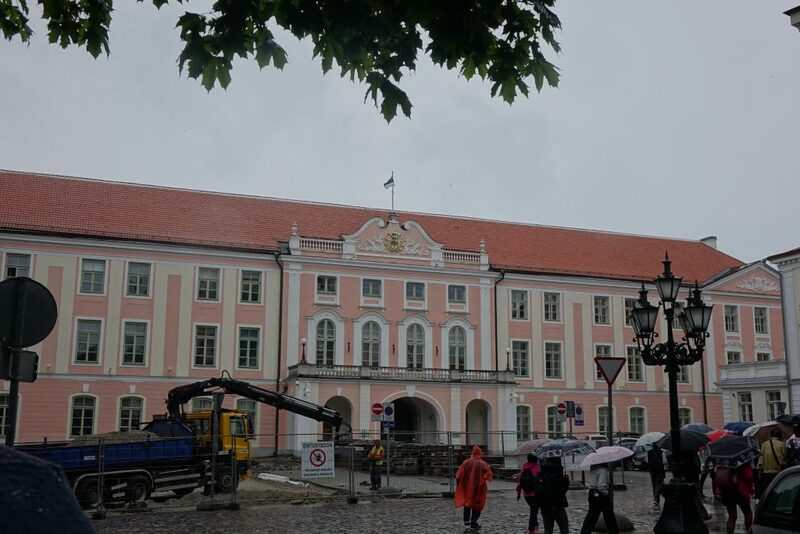 Today I was out to cross another country off my list – Estonia! 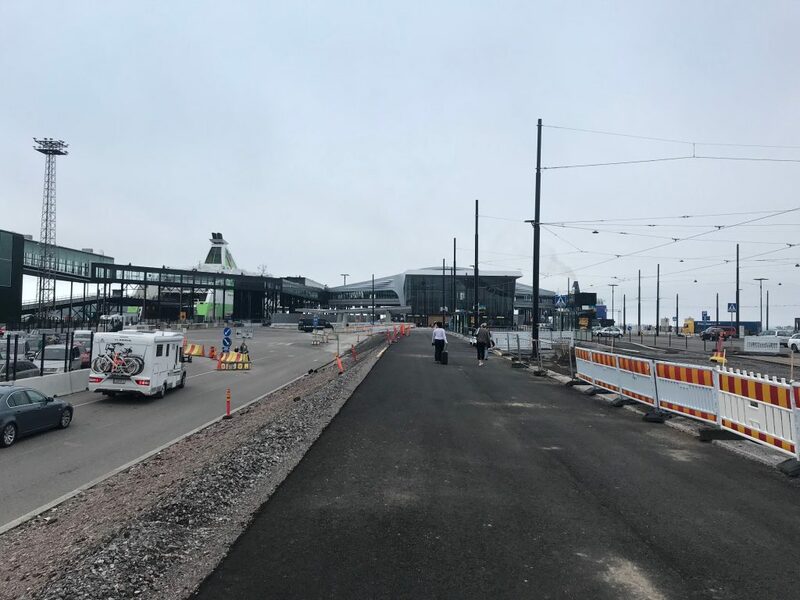 The trams were already running, and I could have taken one, but instead I decided to walk the thirty five minutes or so to one of Helsinki’s ferry terminals. The streets were deserted apart from a couple of runners and some bin men doing their rounds. If my ferry had been leaving from another harbour, it would have been just a ten minute walk, but my early morning stroll was getting my step count for the day off to a good start! After half an hour, the scenery changed as I approached West Harbour’s Terminal 2 – there was loads of building work going on, and roadworks. Terminal 2’s still quite new, so I presume they’re still getting all the infrastructure around the place sorted out. 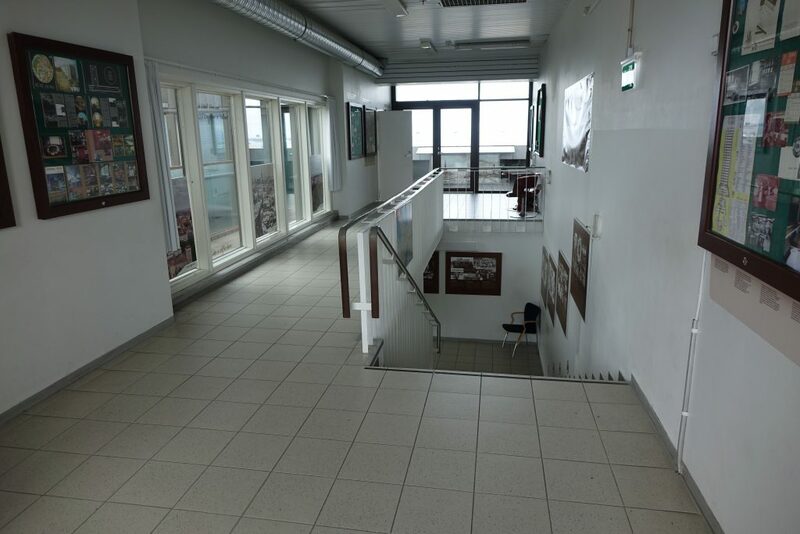 The terminal did look very modern – it was all glass, with a bit of wood thrown in too. 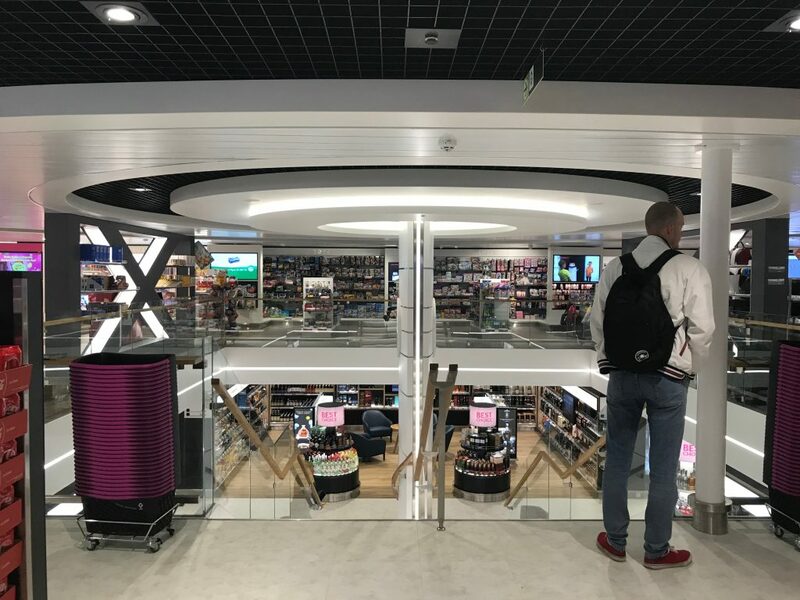 I’d checked in for my trip online, so I just scanned my barcode at the electronic gate and headed upstairs for boarding. 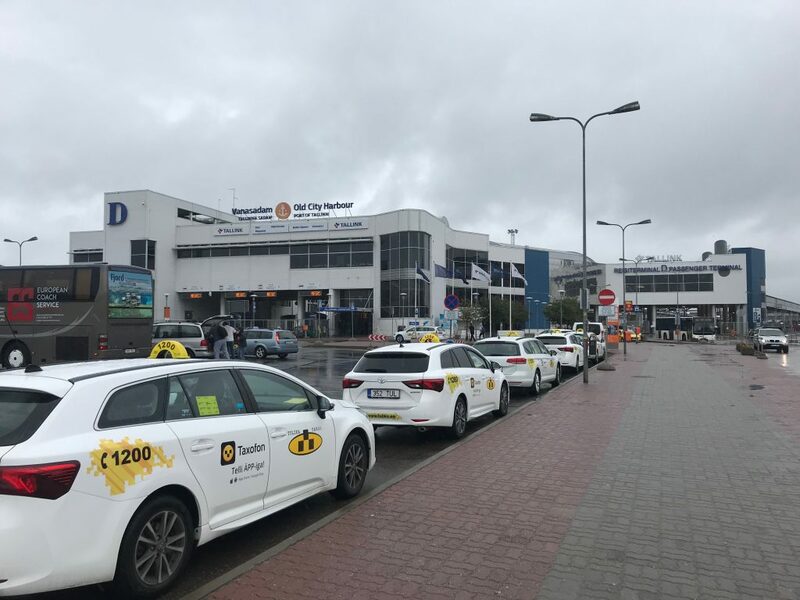 The ferry company had recommended in the confirmation e-mail that you arrive an hour before departure. I couldn’t really believe that was necessary, but turned up at 6.30am for my 7.30 sailing. Sure enough, within ten minutes we were all showing our passports, and clambering aboard. The ship looked absolutely massive! 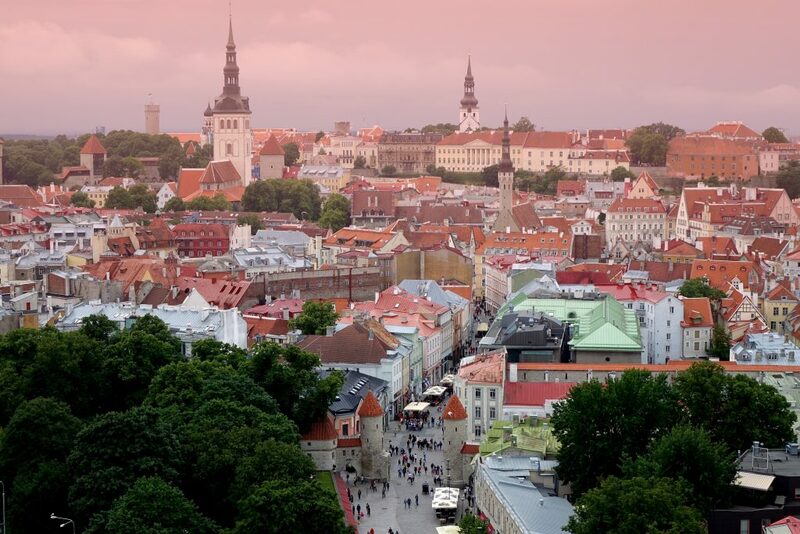 Estonia’s capital Tallinn is just two hours away from Helsinki, and there’s three different ferry companies that all have several sailings a day. For Finns, it’s a good opportunity to stock up on cheap alcohol – which is heavily taxed in their home country. I saw loads of people carrying empty portable trollies, which no doubt would be laden with booze on the return journey! 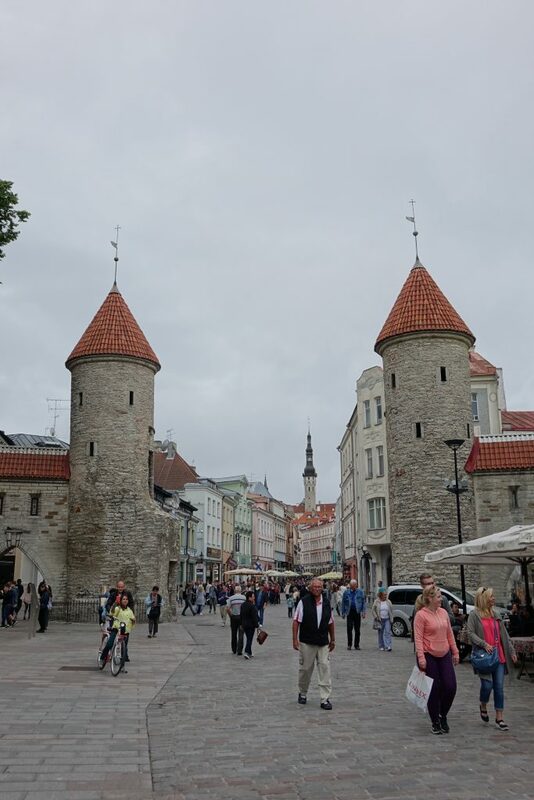 I’d originally booked a day return ticket for just €30 with Linda Line, but as they’re apparently prone to doing, I got a notification a couple of weeks ago to say they’d changed the time of their sailings, and I didn’t think the revised timings would give me enough time to see Tallinn. 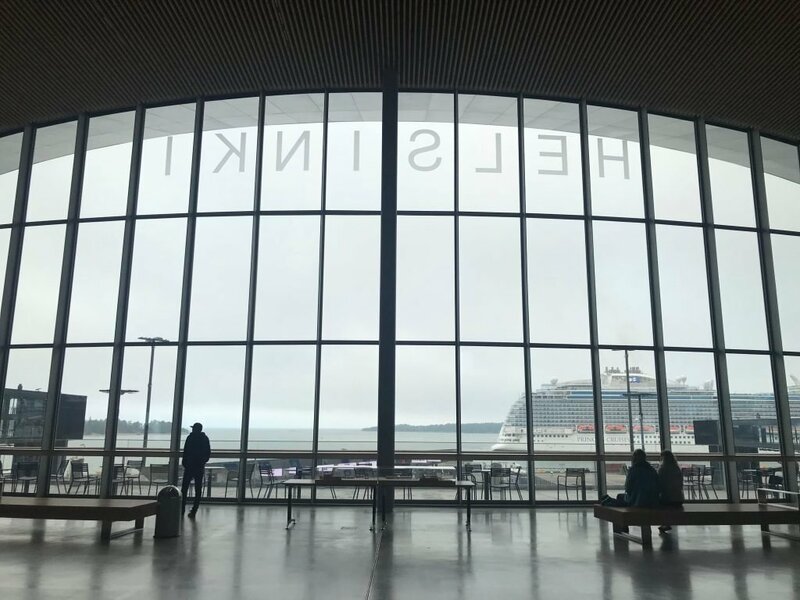 So I cancelled, and rebooked – this time at a cost of about €70 with Tallink Silja. I did pay a little bit extra for a “Comfort Class” ticket. 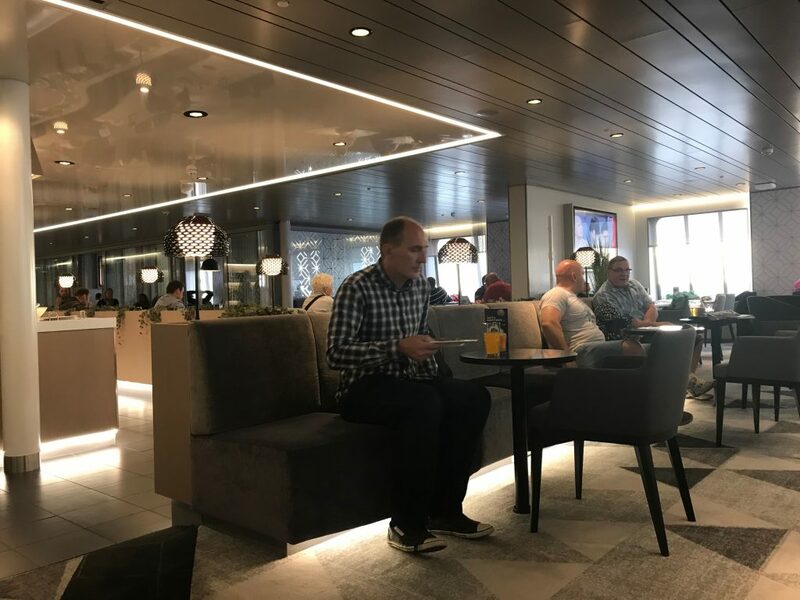 That gives you access to a ‘lounge’ – basically just a quieter seating area, with free coffee, soft drinks and snacks like crudités and minuscule pastries. And nuts. I could have sworn I took a photo in the lounge so I could post it, but I can’t find it, so sorry! Is it worth paying the extra for Comfort Class? Well… probably not to be honest. 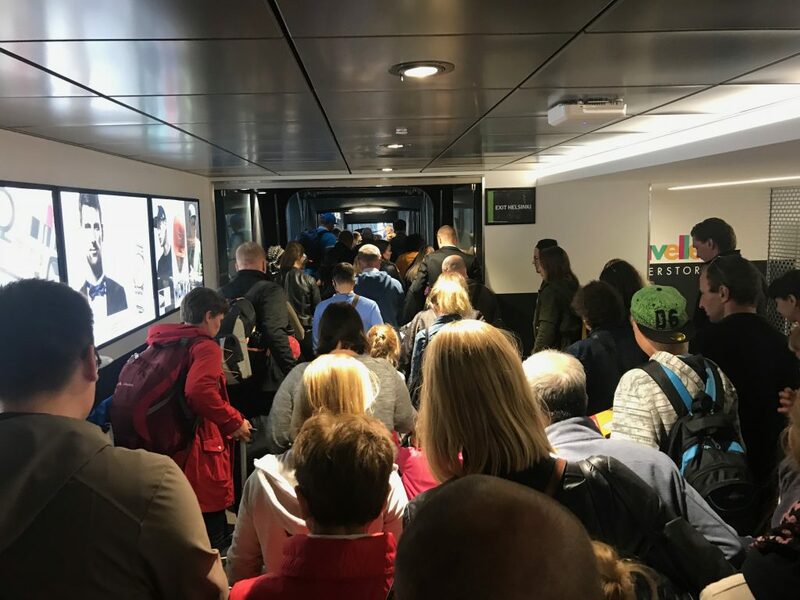 If you’re on board early enough you should be able to snag a seat – the ferry wasn’t absolutely rammed. 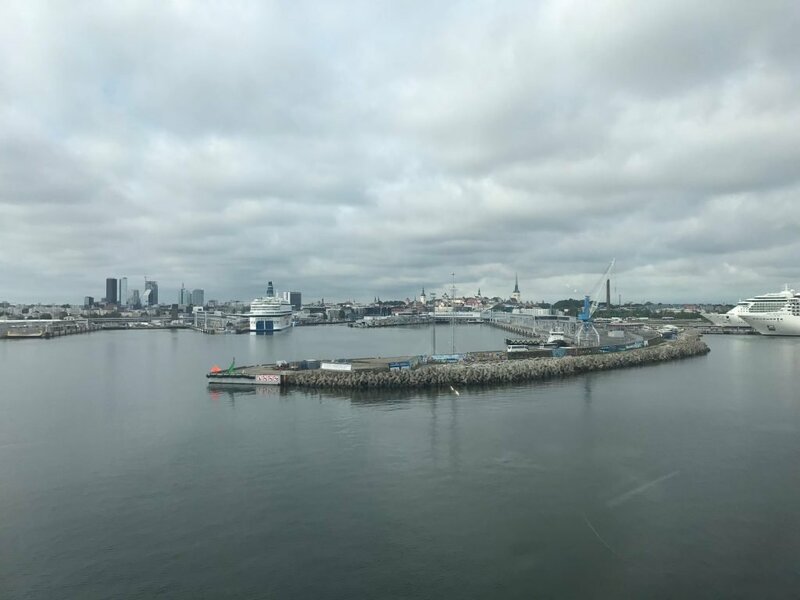 I spent the two hours just writing up my first day’s blog post, and before I knew it, we were nearing Tallinn. Another grey day! But at least it was dry… so far. 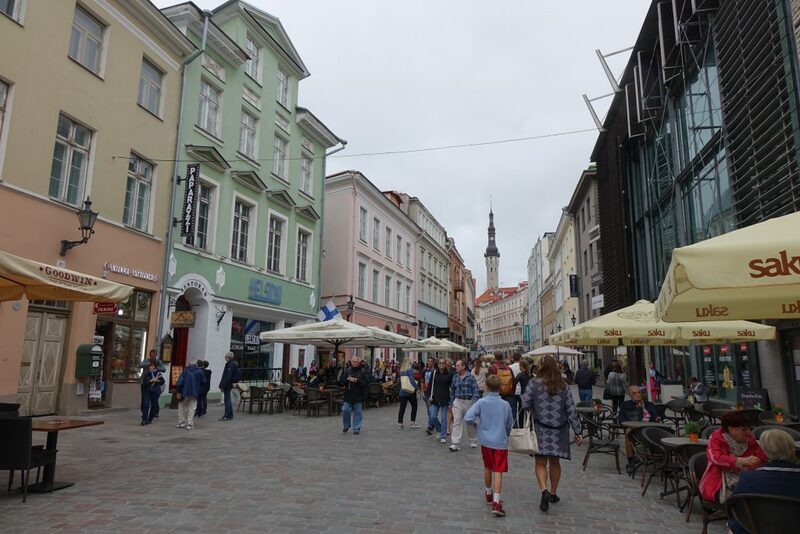 After disembarking, there was no immigration – we were straight out on to Tallinn’s streets. 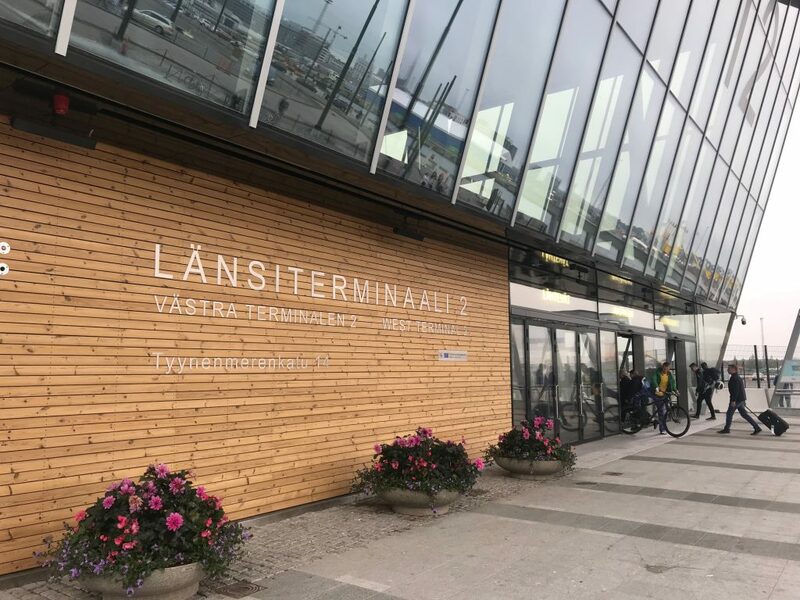 Apparently the only reason we needed to show our passports on boarding was due to Estonia being the current presiding country of the European Council – I don’t think it’s a usual requirement. 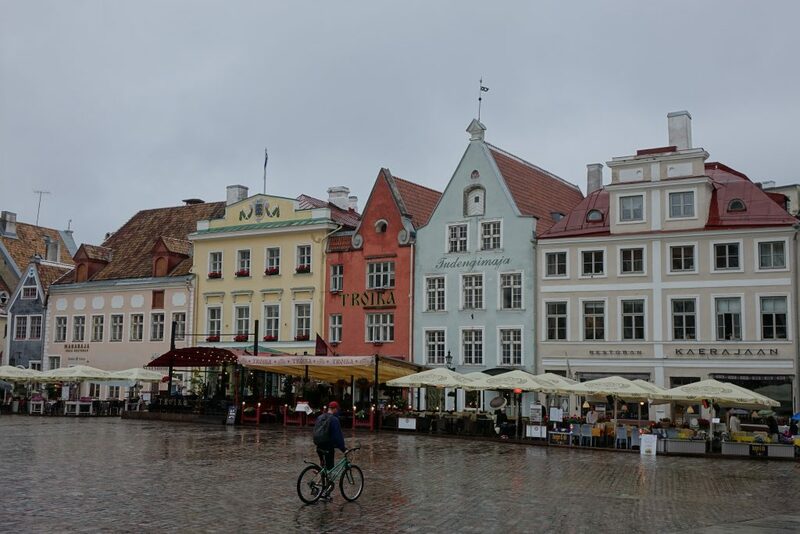 I had an appointment at 11am on the 22nd story of a hotel, but first I decided to head in to Tallinn’s old town and grab a bite of breakfast. There’s no denying it – the old town is just beautiful. It’s really stunning. All the buildings are painted different pastel colours, which just makes them pleasant to look at. The main drag, Viru (above) is REALLY touristy. It’s full of souvenir shops, and even though it was still early, it was already filling up with crowds. After going for a quick stroll, I decided to head to McDonald’s for a bit of McMuffin action. I walked in – and even though it was just after 10am there were no breakfasts on offer. Gutted! I actually thought they didn’t do them, but I just googled it and they do. Including a mean looking porky chicken thing. I must have just been too late. I really didn’t fancy a burger (and that’s a phrase you won’t hear from me often! ), so headed up the street and popped in to the Tourist Information office. I explained I was just there for the day, looked down at the map on the counter and asked what the main sights that the lady would recommend seeing. She explained they were “all on the map in 3D pictures”. I sensed that was as far as I was going to get, so just scooped up the map. 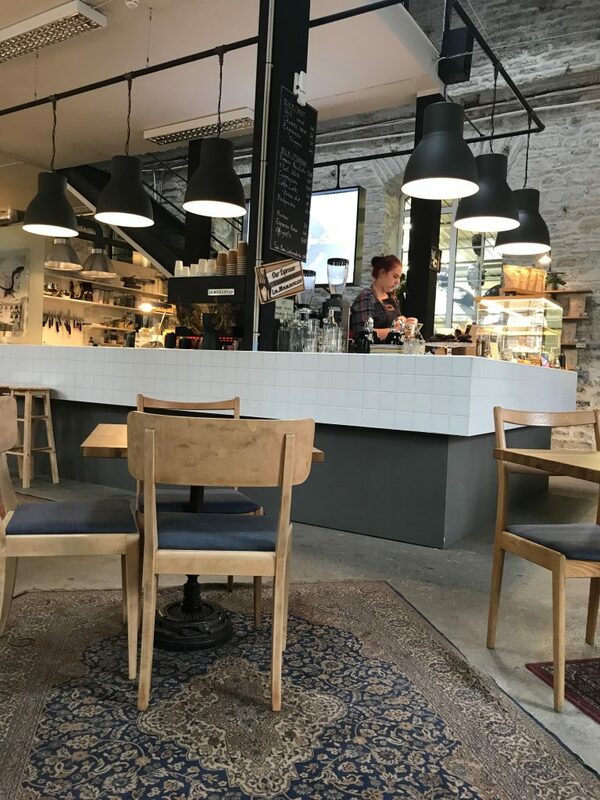 There was a walking tour just leaving outside, but I was desperate for a coffee – and had my appointment – so made a note of when a later tour would be departing and popped into nearby branch of a local Estonian coffee chain called Caffeine. 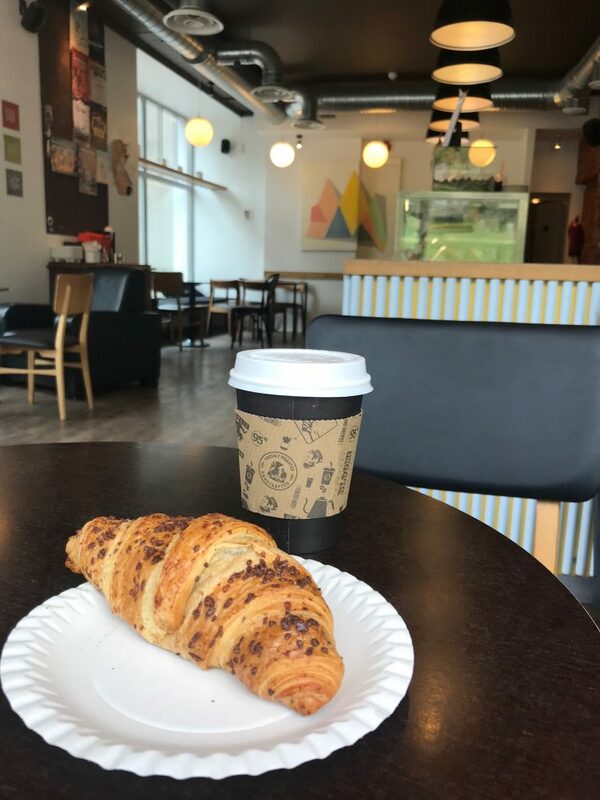 A chocolate croissant and coffee soon sorted me out. Then it was time to set off for my 11am appointment – at Tallin’s Hotel Viru. So why had I come to a normal looking hotel? There was nothing special about reception…. The answer lay next to a vending machine at the back of the hotel. 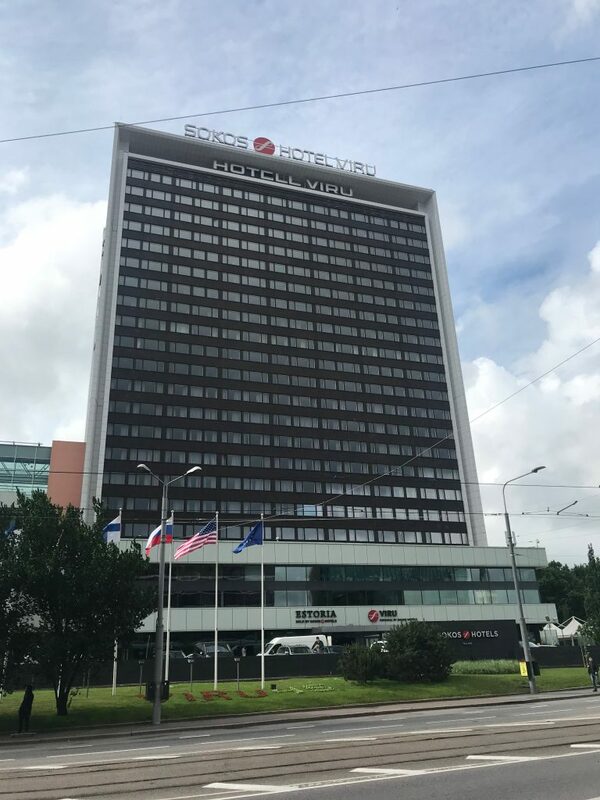 When we arrived by a window, the lady explained that Hotel Viru opened in the early 1970s – when Estonia was still part of the Soviet Union, because the state tourist agency was keen to increase the state’s foreign currency income. To everyone staying and most people working at the hotel, there were 22 floors. 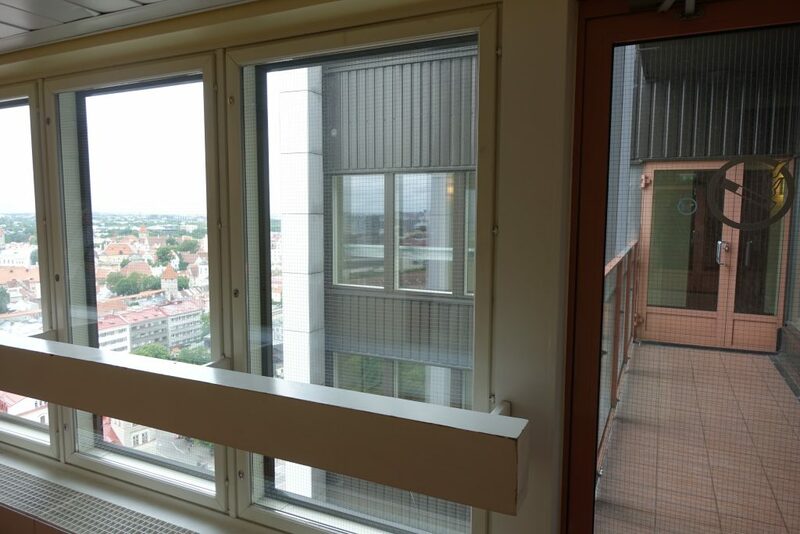 But people in rooms on that floor could spot a floor above (just out of view in the picture above there) and that’s where the KGB agents based in the hotel had their offices. We climbed up some stairs and arrived on the 23rd floor’s landing. 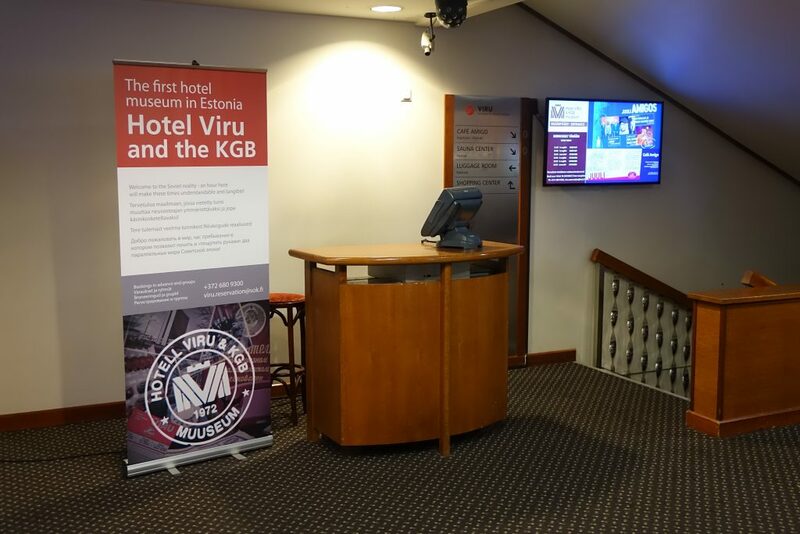 Basically KGB agents were based there to keep a very close eye – and ear – on the tourists coming to stay at the hotel. Anyone who was deemed of ‘interest’ was placed in one of 80 rooms at the hotel that had bugging devices installed. 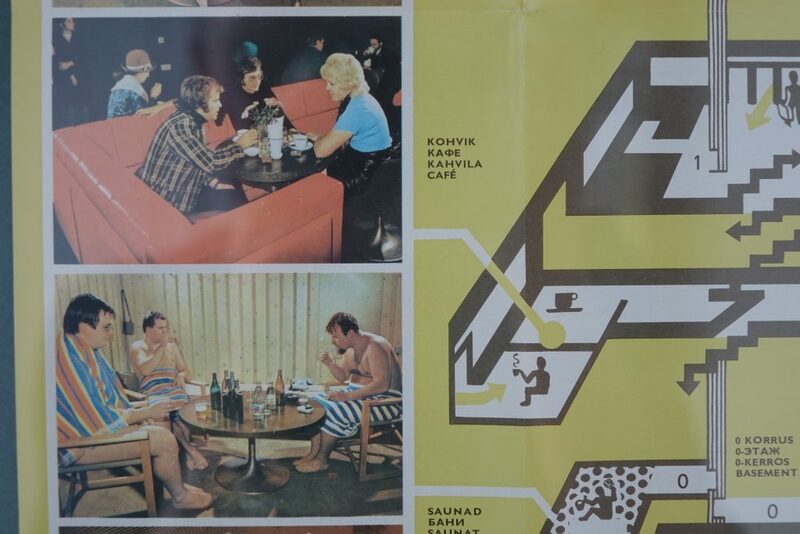 All around the walls were pictures of the hotel in its Soviet era heyday – it looked pretty funky in a 70s kind of way! The lady explained that Hotel Viru was unadulterated communist luxury. The hotel back then contained everything anyone could possibly want – from a shoemaker to a sound recording studio. 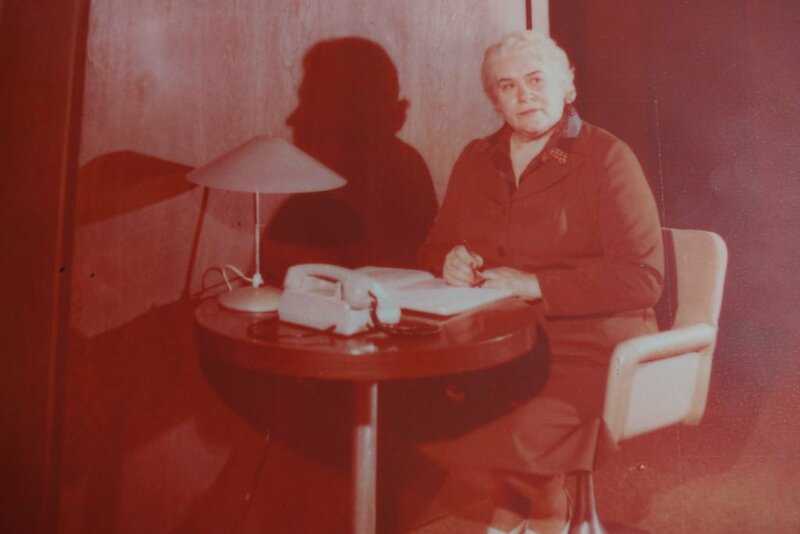 It had, I think, 1000 employees – one woman whose name we saw in an award book was responsible solely for slicing bread! We all went out on to the balcony for a great view of the city. 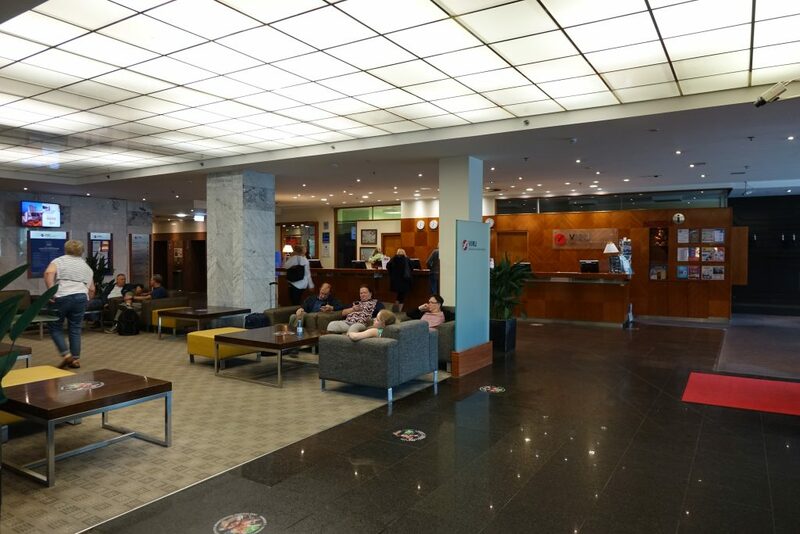 Then we were taken into a room which was kind of mocked up – it had an old hotel manager’s desk in it, but he wouldn’t have been on the 23rd floor. 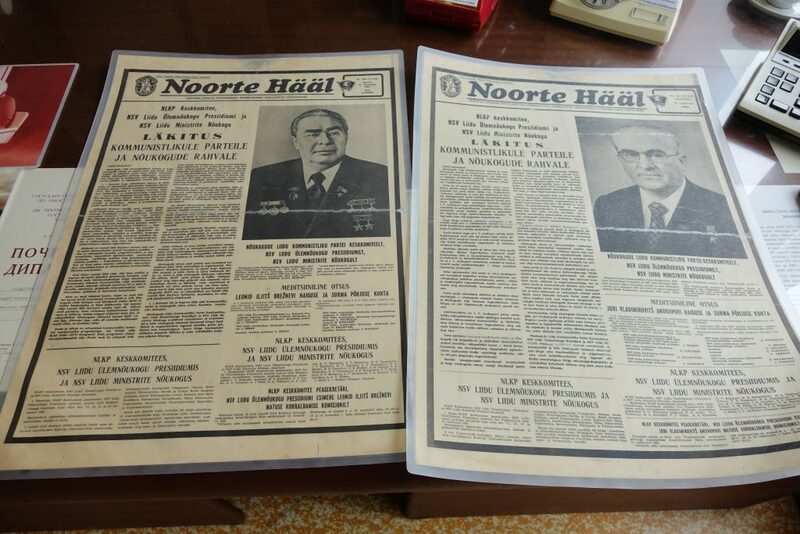 There our guide showed us some old newspaper articles from when Russian leaders had died. What’s interesting though is that the words for both leaders’ deaths are almost exactly identical – that’s because the journalists knew they wouldn’t get in to trouble by writing anything which hadn’t been approved before. See? The headlines are exactly the same for two different people! 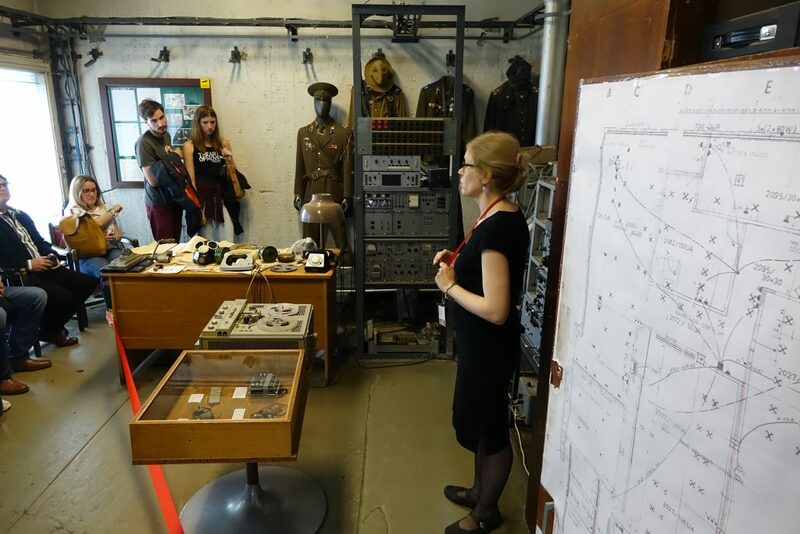 After that we were taken into a room which had been a KGB office – and which still holds some old KGB equipment. The guide told us about a hotel engineer who had received a call about a broken phone on the 23rd floor. When he opened the door, a gun was pointed at his head and he was simply told “there is nothing here”. The KGB in the hotel operated on a completely secret basis. 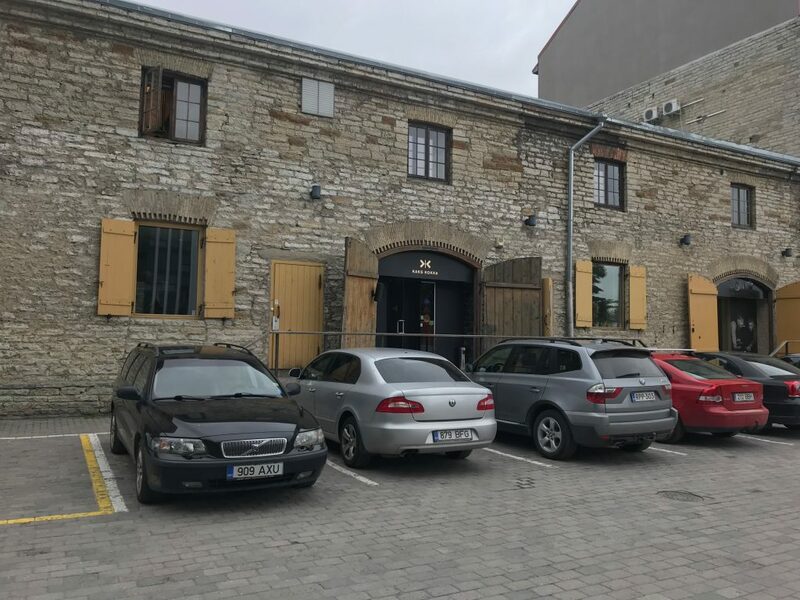 Microphones were on display – and apart from being in the 80 rooms, they were also hidden in ashtrays and even plates in the hotel’s nightclub and restaurant. Waiters there would know where to seat people that were worthy of ‘special attention’. The guide also explained how new staff were put to the test. They were given strict instructions that if they found any mislaid property they had to hand it in, without examining it. She showed us an old red purse that was left around to tempt new joiners. If they opened it, their face would immediately be sprayed with red dye, so the KGB knew they couldn’t be trusted. There were loads of photos around too – including one which showed one of the ladies who had one of the better jobs in the hotel. They were situated by the lifts on every floor – and as a result, saw everything – and everyone. But they’d also get presents from tourists – things from the West which would have been nigh on impossible to find in the USSR. The tour lasted an hour – and it was great. There wasn’t loads and loads to see, but the guide was really good, and really seemed to know her stuff. She had plenty of stories which had been told to her by ex-hotel workers. You can find out more about the tour here. After the tour finished, I headed back down to the 22nd floor and went out on the balcony to get an amazing view of Tallinn’s old town. Next it was time for lunch. 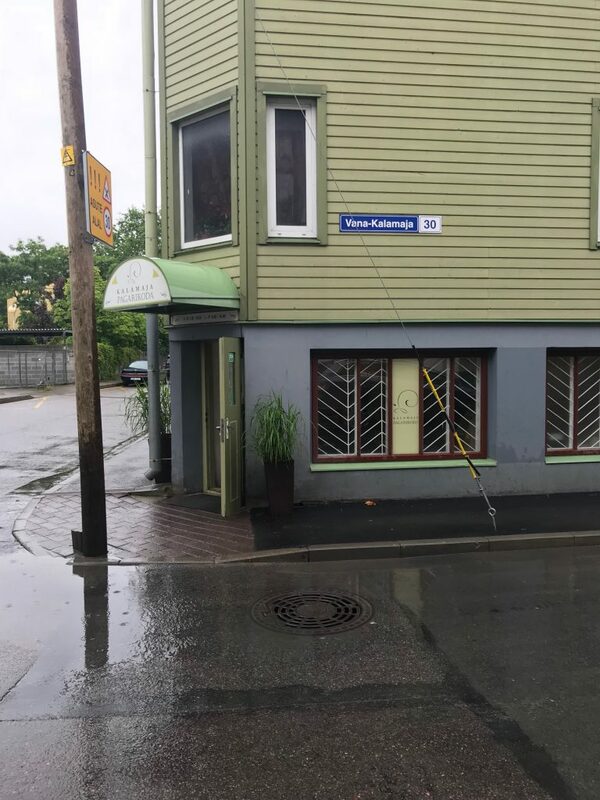 I’d read a recent article in The Guardian about Tallinn’s up and coming chefs, so picked a restaurant from that – Kaks Kokka. The entrance was hidden in a courtyard, about a ten minute walk from the hotel. 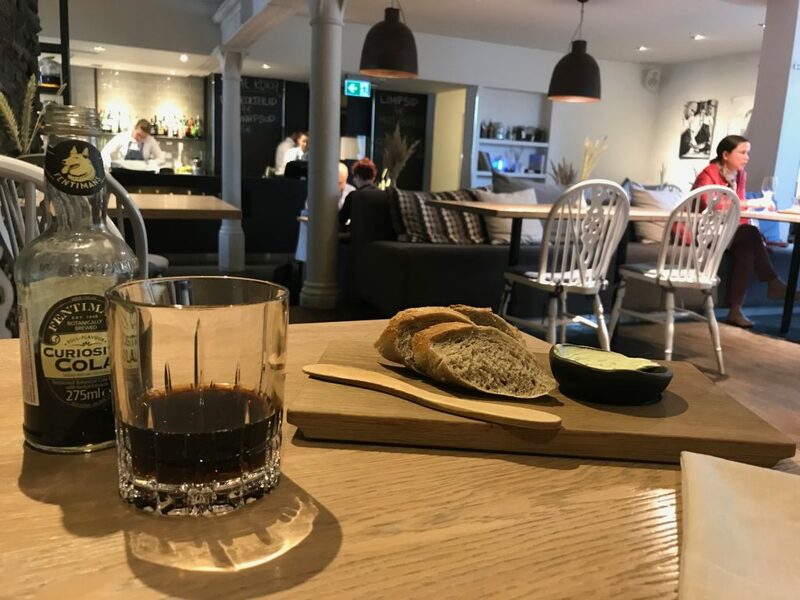 It wasn’t too busy, and I was given some bread with delicious herby, soft whipped butter to start. 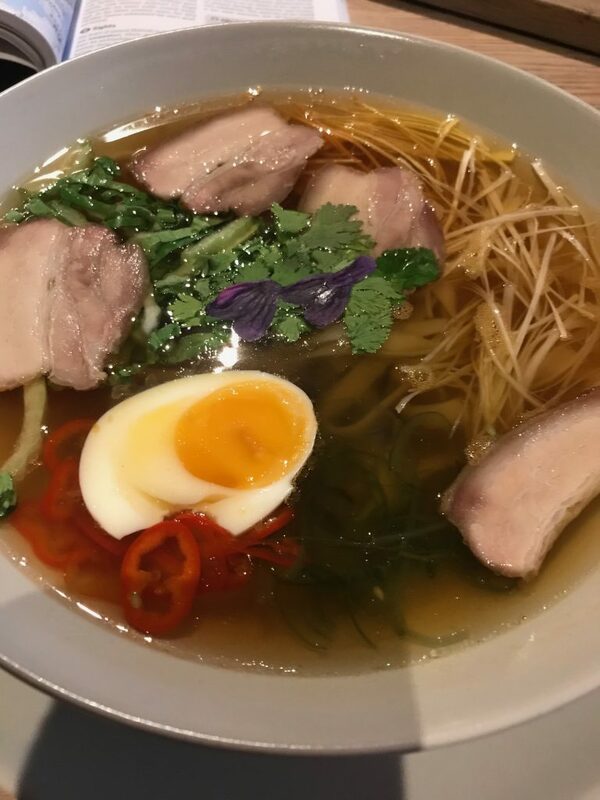 I decided to order the ramen – not particularly Estonian! But it was getting a bit chilly outside, and I thought it would be light and warming. I wasn’t disappointed. It was absolutely delicious, with meltingly soft noodles. With a tip, the meal came to €14, which I thought was a real bargain! Heading outside, it had started raining pretty heavily, which was really annoying, as the forecast was for it to continue raining for the rest of the day. 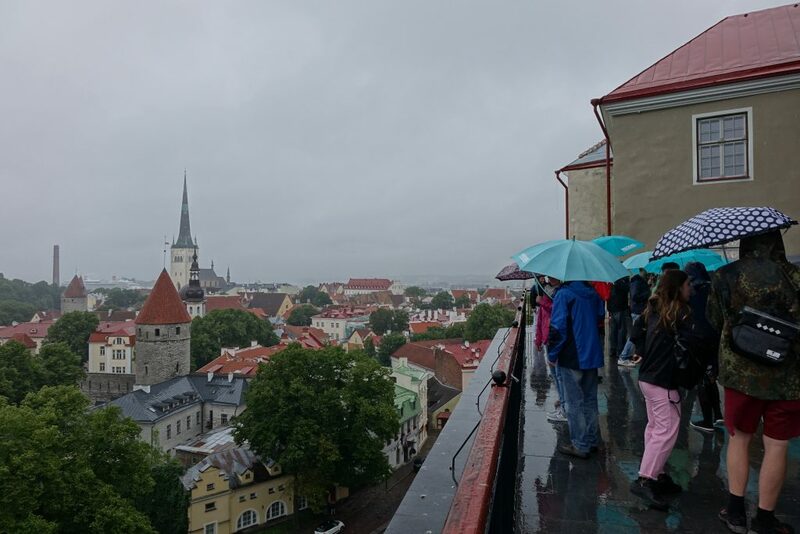 I put my umbrella up, and as I had a bit of time before the walking tour, decided to visit a part of Tallinn’s walls that I’d read gave a great view of the Old Town. I think I got the wrong part of the walls. I paid my €2, and headed up some stairs, but the view wasn’t really spectacular! 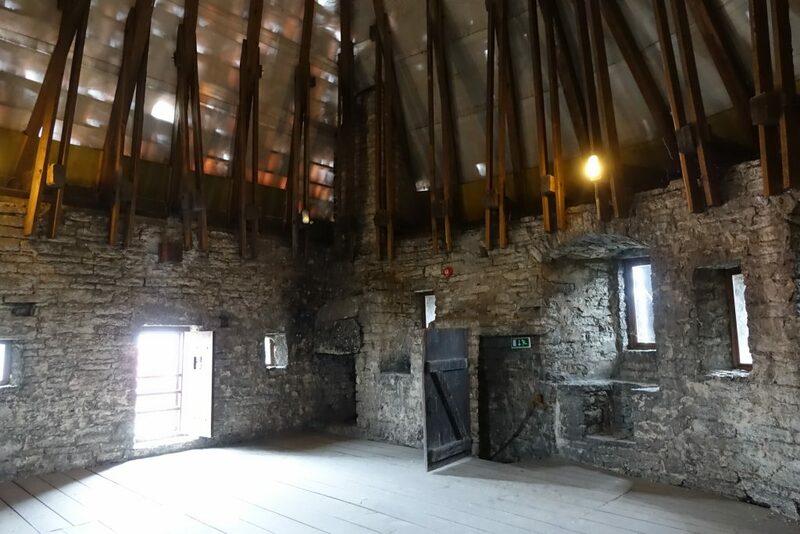 I carried walking along the short piece of wall and climbed up into a tower…. And the view from there was pretty much the same. Two euros wasted! I’d reckoned that by going to a part of the wall in the Upper part of the Old Town I’d have been able to look down on the whole area, but it just wasn’t high enough. 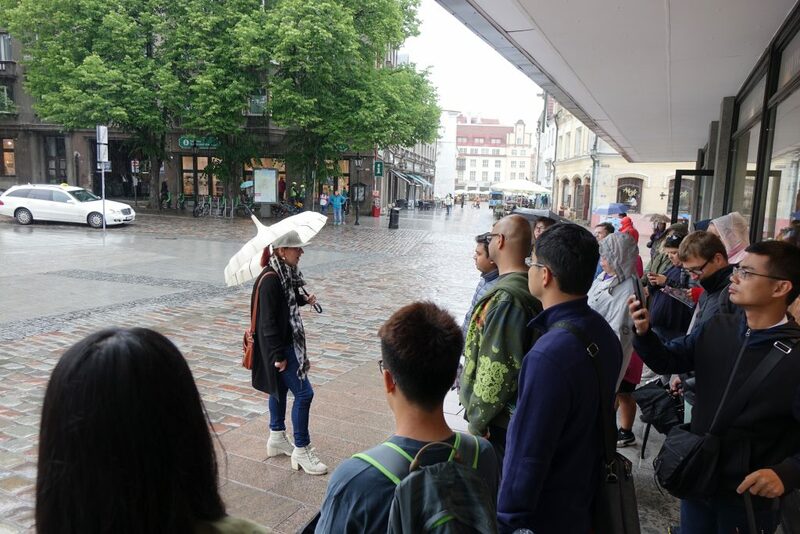 By now, with the rain still pouring down, it was time for the walking tour, so I headed back to the meeting point by the Tourist Information Centre. By now my socks were wet, and the rain was showing no signs of stopping. The tour was one of those ‘free’ ones – where you basically ‘tip’ at the end however much you thought the tour was worth. 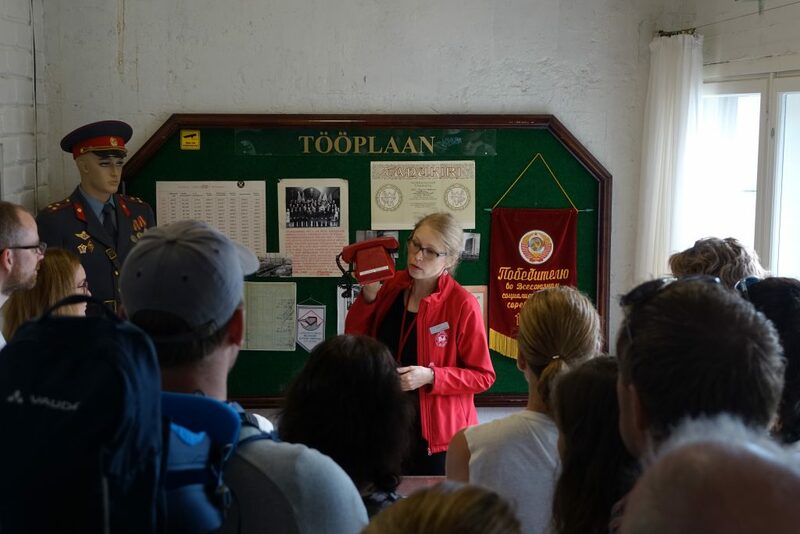 Our guide was great – she was young, funny, and gave us a good insight into what Estonians are like – proud of their small nation, but never really ones to be in a hurry (that did come from her!) After sheltering under a building for the intro, soon we were off. 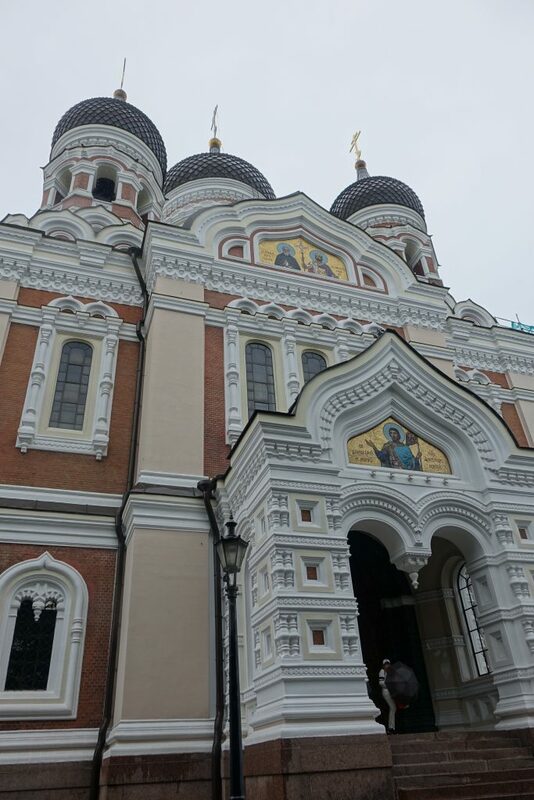 First stop was St Nicholas’s Church, where our guide explained how religion had been banned by the Soviets, and the church had been threatened with becoming derelict as a result. 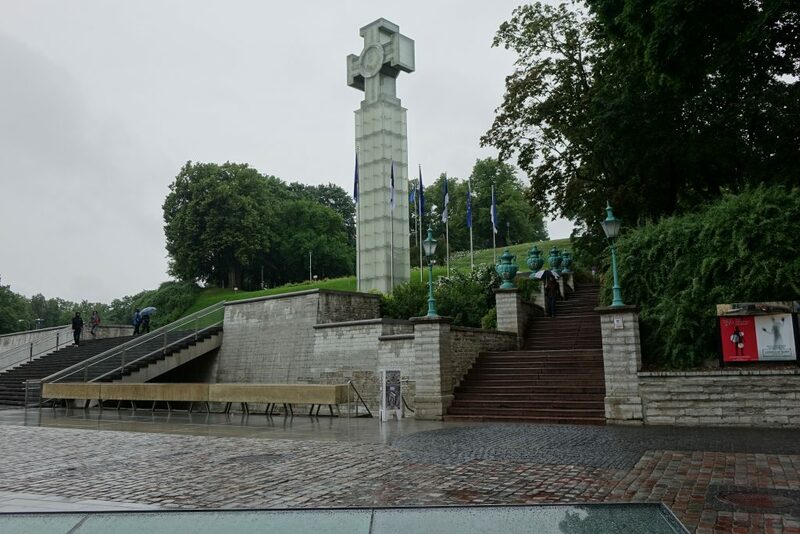 Then just a few steps away, we saw Estonia’s monument to its fairly recent independence. …which was hard to get a good photo of due to the construction work right outside. I was enjoying seeing the sights and hearing from the guide, but there’s no denying the weather was making the whole experience just a bit miserable. The rain was relentless, and when we got to a viewing platform I was desperately wishing it had been a warm – even mild – and sunny day! 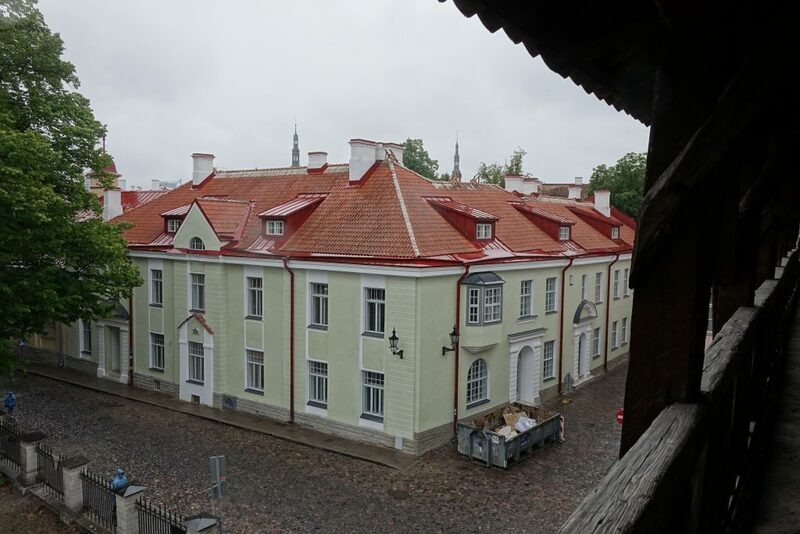 After an hour and a half, the tour was over, ending up in Raekoja Plats – town hall square. Not many people outside in the square in that weather! I was planning to pay €6 for the tour, but I only had a ten euro note, so it ended up costing me a bit more than I’d planned, as I felt it would be a bit cheeky asking for change. 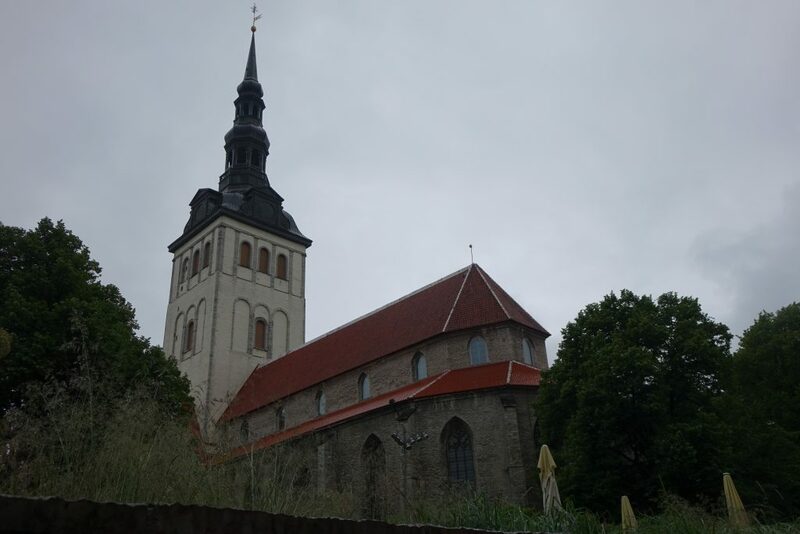 After seeing the touristy part of town, I wanted to get a bit of a feel for a different side of Tallinn. 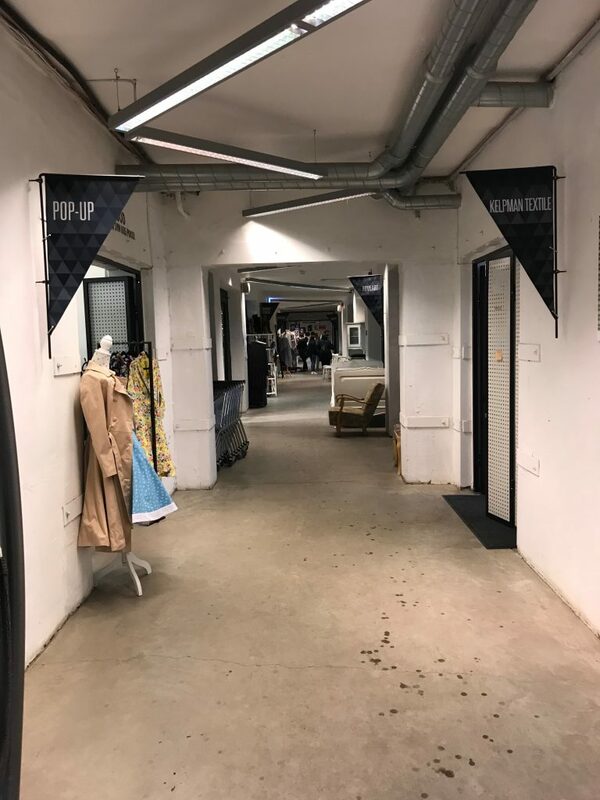 The tour guide had pointed out the hipster part of the city, Kalamaja, from the viewing platform, and after a quick bit of googling I picked a pleasant sounding bakery to visit, and “Tallinn Creative City” – a business hub for creatives, which also has some cool independent shops and cafes. The bakery was 20 minutes walk away. 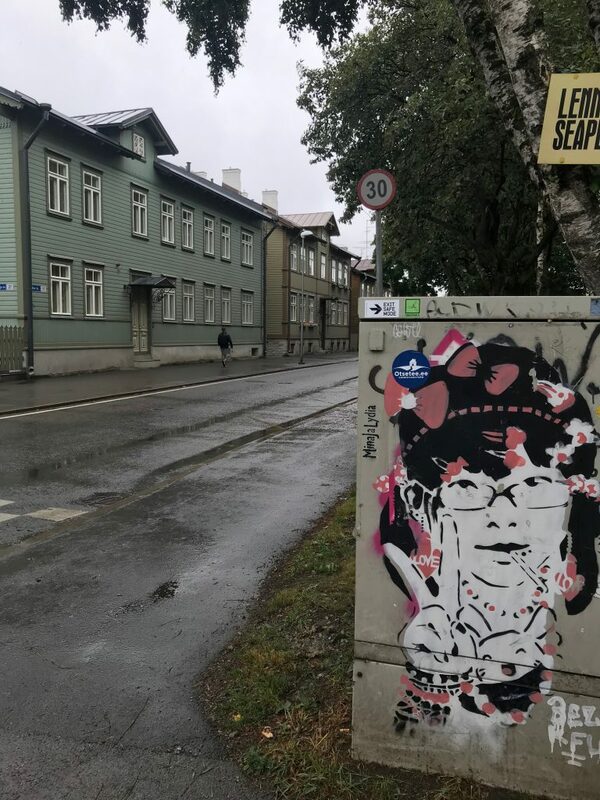 I felt like I’d done enough walking, but did want to see another side of Tallinn, so with the rain still coming down, I set off and walked for what felt more like an hour. Pretty quickly I was just walking through residential streets, with houses made out of wood. But there were clear signs I was in the hipster part of town! Eventually I arrived at the bakery. But it didn’t look particularly inviting – or warm. And peeking down stairs through the entrance, it was completely deserted. So I decided to give it a miss, and keep trudging for another 20 minutes until I got to the Creative City. I got there at 5.20pm, and of course it closed at 6pm. 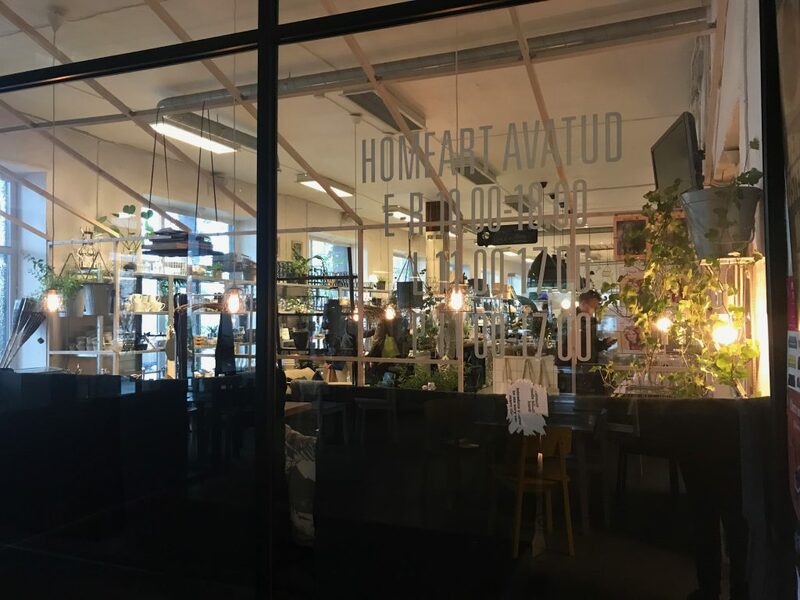 So I grabbed what was an amazing coffee in a cool place called Reval, and literally drank it as soon as it was cool enough. 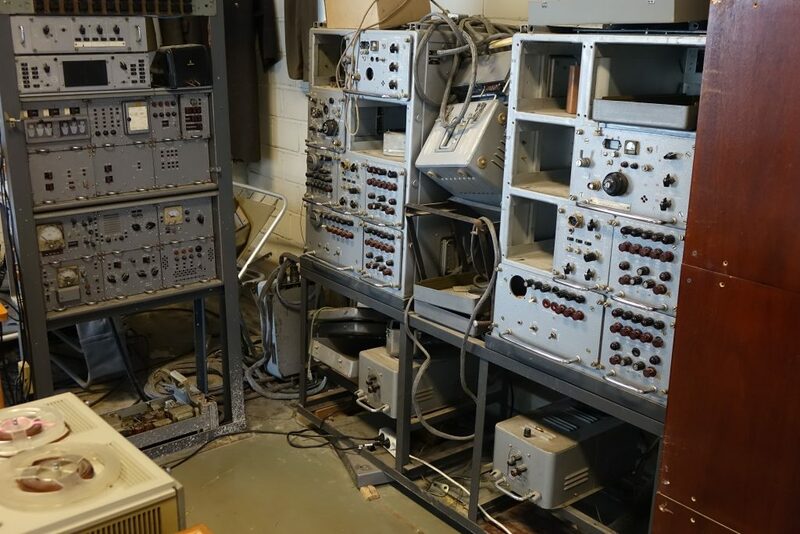 I then hotfooted it to one of the other ten buildings around the site that had some interesting sounding units in it, and had a very rushed look around. Off the corridors there were loads of independent cool shops – like this one. 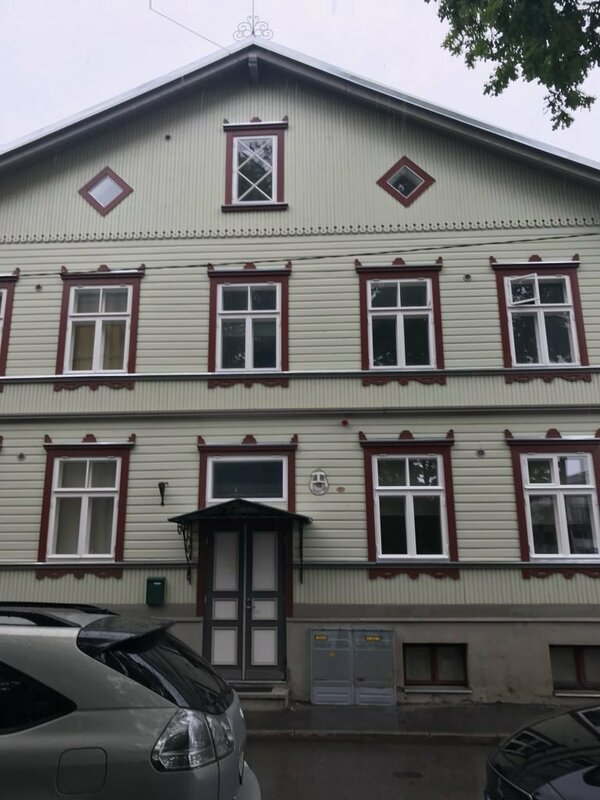 But by now, the shops were beginning to pull their shutters – so I stepped back into the rain, and set off on the 35 minute walk back to the ferry terminal. I can’t tell you how relieved I was when Terminal D eventually came into view. By now I was just a bit fed up – cold, tired, and with wet feet. Thankfully again we boarded pretty quickly after I arrived. This time the ferry was even bigger. 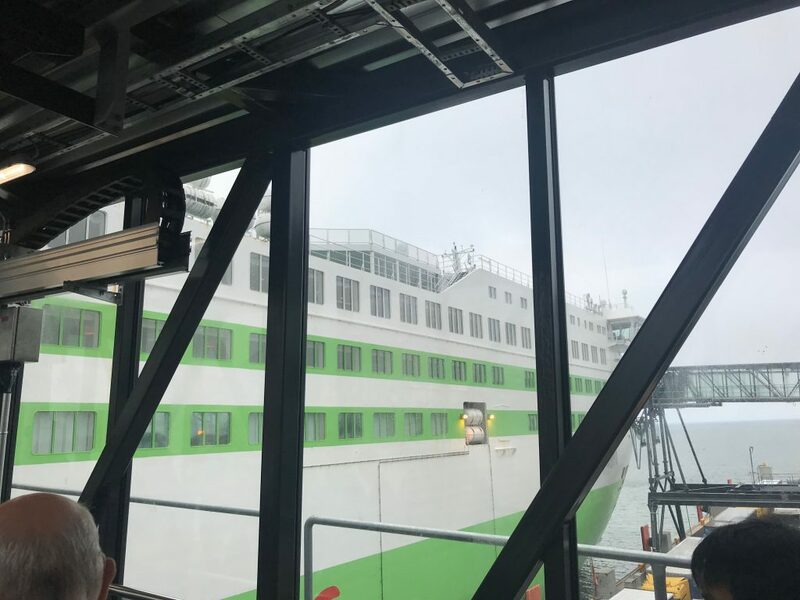 I was on Megastar – Tallink Silja’s newest ship. The on board shop was more like a department store! This time I do have a picture of Comfort Class…. I probably did get my money’s worth with the free coffee – I fired it into me to try and warm up. After an uneventful crossing, soon we were back in Helsinki, though there was a fair queue to disembark this time. 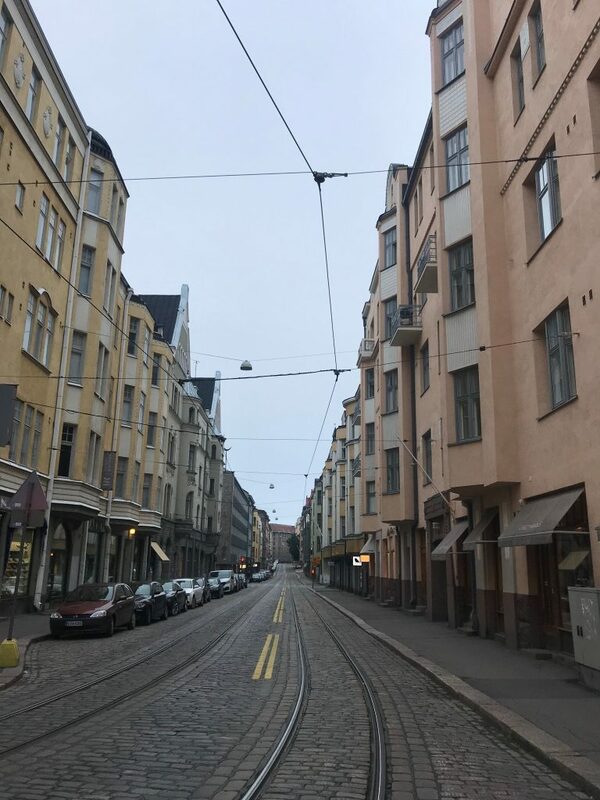 There was no way I was walking back to the hotel, so I jumped on a tram, and at about 10.30pm, I was back at my hotel. I’d done 31,814 steps, and walked sixteen miles. 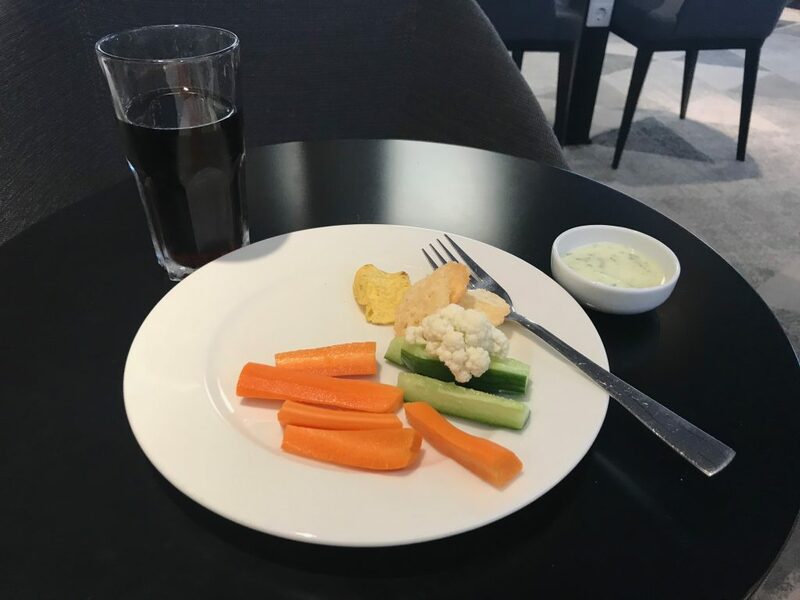 Nothing was open for food, so after a cheeky glass of well-deserved (I felt) wine in the hotel bar, I headed to bed – determined to have a more chilled out day tomorrow. 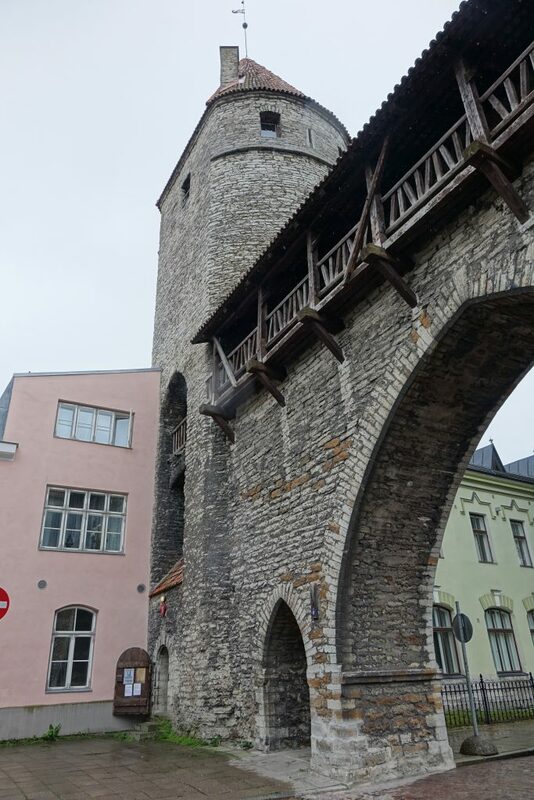 Tallinn seems like a beautiful, buzzing city with an interesting past – I think it’s probably worthy of more than a day trip. If you visit, I hope the sun’s shining!